Travis Parker has everything a man could want: a good job; loyal friends; his dream home in small-town North Carolina. In full pursuit of the good life, he believes that a serious relationship with a woman would only cramp his style. That is until Gabby Holland moves in next door. Despite Travis's attempts to be friendly, she seems to have a chip on her shoulder about him. But something compels Travis to get to know his new neighbour. His persistent efforts lead them both to make tough decisions, the consequences of which neither could have foreseen. With over 100 million copies of his books sold, Nicholas Sparks is one of the world's most beloved storytellers. His novels include twelve number one New York Times bestsellers. All Nicholas Sparks' books have been international bestsellers and have been translated into more than fifty languages. 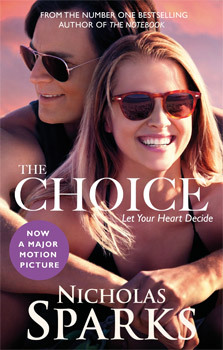 Ten of his novels have been adapted into major films " The Longest Ride, The Best of Me, Safe Haven, The Lucky One, The Last Song, Dear John, Nights in Rodanthe, Message in a Bottle, A Walk to Remember and The Notebook " with The Choice coming in Spring 2016.